If your hosting plans supports addon domains, you can add multiple domains to the same web hosting package. This will allow you to host multiple websites on the same account, without needing to buy an additional package. - The Startup plan allows a single hosted domain, meaning you won't be able to add any addon domains. You can place an upgrade to the Business plan or higher through your client area. - The Business plan allows four hosted domains, meaning you can add up to three addon domains. - The Enterprise plan allows for eleven hosted domains, meaning you can add up to ten addon domains. First, you will want to acquire the domain you wish to add. You can register a domain through us, or use another domain from another domain registration company. If you wish to purchase a domain from us, you can place an order here. When ordering a domain from us, if you intend to add it as an Addon Domain, you should not order hosting with the domain. To begin, you should first visit the "Addon Domains" section of your cPanel to add the new domain. Once you are in the Addon Domains page, you should enter the domain you wish to add under the "New Domain Name" field. You should not include "www" or "http" - only include the domain name. Once you have entered your domain, you can click "Add Domain" to create the domain name. The "Subdomain" and "Document Root" fields will automatically be filled out. cPanel automatically creates a subdomain for each addon domain you create. This subdomain can be ignored - it is for internal system use. The last step is the most important: you must update the nameservers for your addon domain. Visit our nameservers wiki page to learn more about this. 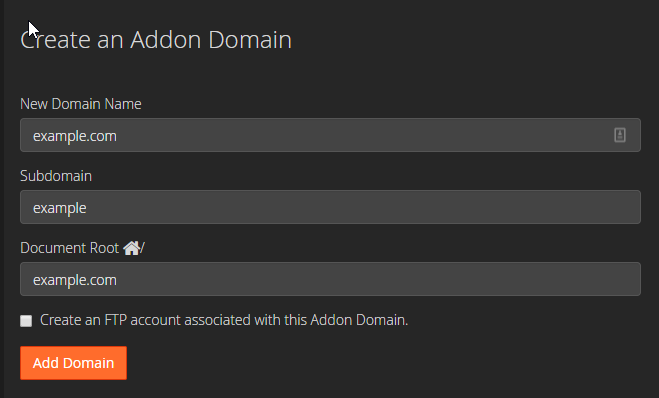 Once your addon domain has been created, you can return the same Addon Domains page to view the domain's configuration. The "Document Root" field will show which folder the domain lives in. For example, the default configuration is that a folder will be created with the same name as your domain. In our example, we created a domain named "example.com", so all files for this domain should be added to the folder "/example.com"
This page was last edited on 17 April 2019, at 22:20.